I still remember my first amazing meal in Paris. It was at a small restaurant in the Marais and I was with my friends Jim, Jean-Pierre, and Philippe. Jean-Pierre knew the chef, Jacques Brosse, and told us we were in for a treat. I asked Jacques for a plate des legumes as a vegetarian dinner. I was given a wonderful plate of side dishes, but there was one item that I still taste when I close my eyes and remember. It was an extremely simple dish of the juiciest cherry tomatoes. I can’t tell you what Jacques did to them. I imagine he hollowed out the little guys, chopped up the tomato “meat”, mixed it with salt and herbs and filled them again. These tiny little treats absolutely blew my mind. I had no idea so much flavor could be packed into such a tiny bite. After the main course, Jacques presented us with the molten lava cake that has become so common in expensive restaurants. This was about 14 years ago and I’d never heard of the dish. It came with a raspberry sauce and was literally to die for. We returned the next night for more of the cake. Over the years, I’ve followed Jacques as he moved from one restaurant to another. 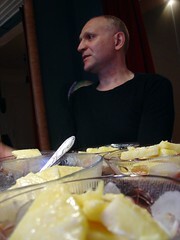 He’s made some of the best vegetarian food that I’ve ever eaten. One night, he served a special version of French Onion soup for me. It was made with red wine instead of beef stock. I still bug him for that again. 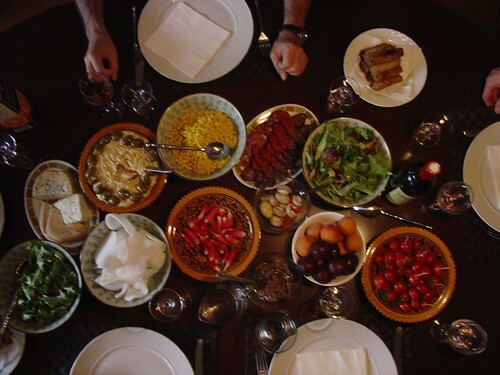 He’s also created a wide assortment of mediteranean and French cuisine. The hits keep on coming. I just remembered a medley of about 10 wild mushrooms, the best hummus, guacamole that was far better than anything I’ve had in California…and I grew up with Avocado trees every where you look. So now you know how much I admire Jacques’ skills as a chef. He has a new restaurant and I stopped by today to say hello. Chez Alexandre serves traditional French cuisine in a large space a block away from Galeries Lafayette. There is a twist, the restaurant’s main clientele are Chinese and Russian tour groups. They have a large dining room upstairs for these groups and individual diners enjoy the space downstairs. I asked him today about the vegetarian choices at Chez Alexandre. Interestingly, a significant portion of their visitors are Buddhists, for which Jacques creates vegan dishes every night. Tonight he had reservations for 10 vegans amongst the various groups. Their main dish will be stuffed vegetables with vegan risotto and chopped vegetables. 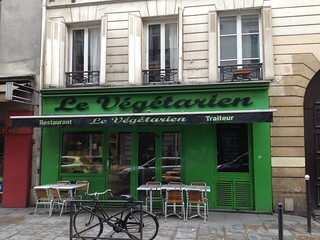 Reservations are suggested if you’d like to try a vegan dinner. You can always request a plate des legumes and you won’t be disappointed. While I’m one of Jacques’ loyal followers, I have not eaten at Chez Alexandre yet. I stopped by today while they were closed before dinner. I plan on returning very soon and will update this with a full review of the meal. Menus are available in many languages. Jacques is fluent in English, French, and Chinese. If it’s slow, don’t be afraid to see if you can visit with him and say hello. Tell him Ted sent you.